They say hard work always pay. And yes it does. But what should one do when the result of his hard work opens a gamut of options for him, one better than the other, leaving him in the dilemma of making a decision that is right for him. This is the same situation, I faced when choosing the right B- School among the options in my kitty. I had narrowed down the choices to DIME, IIT Kanpur and VGSOM, IIT Kharagpur. As they say ‘Decisions determine Destiny’ and my decision was MBA at IIT Kanpur. And there hasn’t been a moment when I regret it. Stepping into 1100 acre lush green massive campus of IIT Kanpur instils in you a feeling of pride.The session started in July with one week of rigorous induction and orientation organised by our seniors. From making a marketing campaign, to pondering our heads into case studies of M&A, Analytics, Current Affairs etc- the assignments gave us a brief glimpse of the two years ahead. The academic session started post induction. The prodigious faculty and their unique teaching styles added to an overwhelming learning experience from day one. We were handed down with some articles, group assignments, and case study material to be presented and discussed. IIT Kanpur has a culture wherein it always values quality over quantity. This truly reflects in each and every aspect of the curriculum and course here that provides academic and professional excellence. 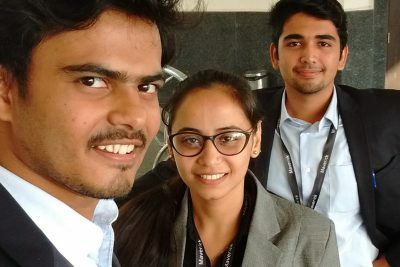 In the midst of adjusting to the new campus life, meeting new batch mates, interacting with the seniors and working hard to meet the deadlines for assignments and presentations and learning ways to effectively manage time, came the competition- Deloitte Maverick Season V, Case Study Challenge. I participated with my other two batch mates as team SYZYGY. The case was based on strategic and financial assessment for the possible mergers of a US-based telecom company. We got a chance to represent DIME, IIT Kanpur in the North Zone Regional held at Delhi. It was an exceptional learning experience for us. For me, the connection with Deloitte didn’t end there. Deloitte visited our campus to hire MBA interns. Bagging an internship at Deloitte within one month of joining MBA IIT Kanpur will always remain one proud moment for me. The journey ahead saw Prabandhan’16, the Sixth Edition of the Annual Management Fest of MBA, IIT Kanpur. Prabandhan is a completely student driven activity and a great platform to showcase your management skills and hone them further. The fruit to our hard work was the participation of colleges of the likes of IIM Indore, ISB Hyderabad, SIBM Pune, IMT Ghaziabad and others. Prabandhan also provided an opportunity to interact with bigwigs of the industry in form of Pragyan- the guest lecture series of Prabandhan. The journey so far has been an exciting one- one to remember. Only one semester has gone by and I have another three more semesters of an invigorating journey ahead!! Cheers to DIME, IIT Kanpur!